From the Tang through the Ming dynasties there survive a number of qin melody titles connected to the story of Wang Zhaojun.4 Such titles include but are not limited to such alternate titles of the present melody as Zhaojun Yuan and Zhaojun Chu Sai. The present title, Longshuo Cao, seems to survive first from here in Shen Qi Mi Pu (1425), but according to Xu Jian's Outline History the melody is still related to the much older titles. On the other hand, versions of the present melody, though very commonly found in Ming dynasty handbooks, are not to be found in handbooks after 1618. Instead, in 1689, they were replaced by a completely new melody using standard tuning. At least 10 Qing dynasty handbooks include a version of this new melody, often called Dragon Soaring Melody (Longxiang Cao) but also using the older titles. The fact that these are often incorrectly said to be related to the earlier melody may suggest that the 1425 Longshuo Cao might also have been a recent creation. The melody concerns a very famous Chinese story, one of several which tell of women forced to live among the Central Asian nomads.5 Of the present story Zhu Quan gives only the bare bones.6 Wang Zhaojun was the most beautiful of several hundred women selected by minister and court painter Mao Yanshou for the seraglio of Emperor Han Yuan Di (r. 48 - 32 BC). However, the emperor had so many concubines he never saw many of them in person, only portraits by Mao Yanshou. Because she refused to bribe Mao he disfigured her portrait and Zhaojun was sent to live in the Cold Palace, where she never met the sovereign. Eventually, however, she was selected as wife by a Central Asian Xiongnu prince. Only then did the Emperor see her and learn the truth. He fell immediately in love and had Mao executed, but it he couldn't cancel the marriage as he needed the alliance with the Xiongnu. Like Cai Wenji, who two centuries later was married to a Turkic prince (see Xiao Hujia and Da Hujia), Zhaojun raised a family on the steppes; but unlike Wenji, who eventually returned to China, Zhaojun died in the foreign land. The huangzhong tuning apparently lost favor during the Ming dynasty. In addition, the melody generally avoids using the 1st string, making it rather comparable with ruibin mode. This probably explains why at the end of the 16th century the tuning for Huangyun Qiusai changed to ruibin, though the melody changed little. Besides my own, there are also recordings by Chen Changlin and Cheng Gongliang of their own reconstructions from SQMP. as for this piece, during the reign of Han Yuandi the Han dynasty was becoming strong. 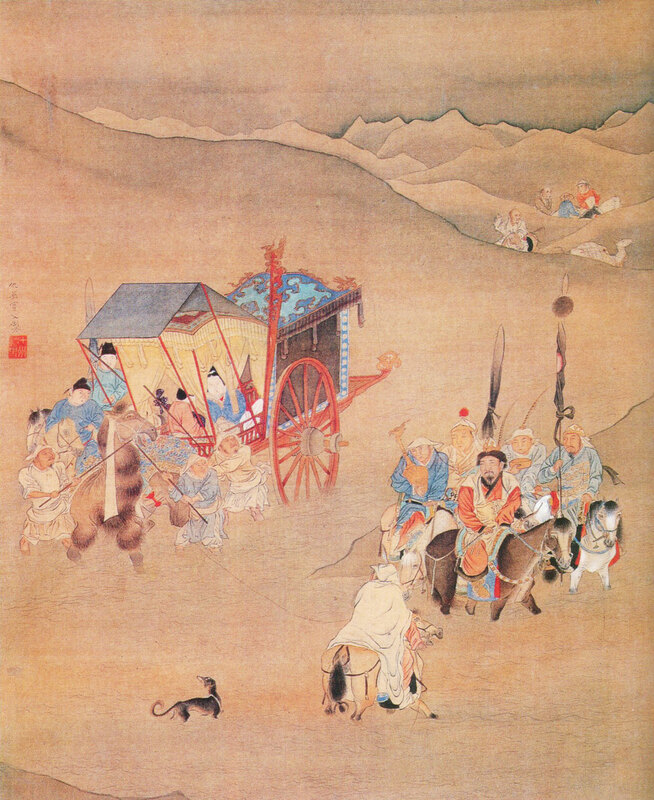 The Khan of the Xiongnu, fearing an attack (from Han), came in person for an audience with the Emperor, saying he would willingly become a son-in-law to help protect the border regions; so the Emperor presented him with Zhaojun. 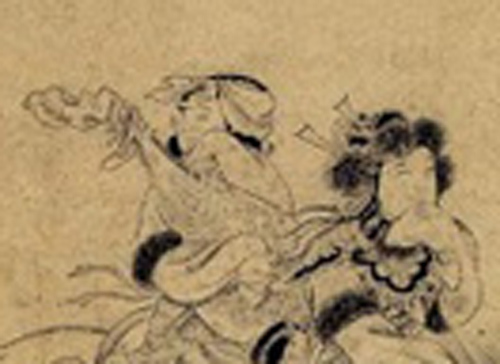 Although Zhaojun was the most beautiful woman (in the palace), she had not yet earned the rank of Han Palace Concubine. So she was betrothed to this nomad who stank of goats and fish. Upon this she hid her face and cried great tears. She restrained her despondency at going north, and endured the shame of fragrant and stinking flowers mixed together, and the lament of water and charcoal in the same stove. Her contemporaries sighed at beauty having such an evil fate. Thus a song for strings was written to give form to the grief. while all the nomads sing. (Music same as 2, but "slow"). 49812.295 has only 龍朔 ([dragon] north). Likewise 12/1477 says only "見龍荒朔漠 see long huang shuo mo", which in turn (12/1472) says only, "北方塞外荒漠之地，亦指在這些地方的少數民族國家 northern wastelands beyond the borders, and also the minority groups that live there." Longshuo was also a reign period (661-663) during Tang Gaozong. Xu Jian's Outline History, Chapter 5, Part 2/2 (pp. 64-69) traces this and related titles such as 昭君怨 Zhaojun Yuan. For 龍翔操 Longxiang Cao see below. For Huangzhong or Wuyi mode, slacken 1st, tighten 5th strings each a half step. For more details on this mode see Shenpin Wuyi Yi. For more on modes in general see Modality in Early Ming Qin Tablature. 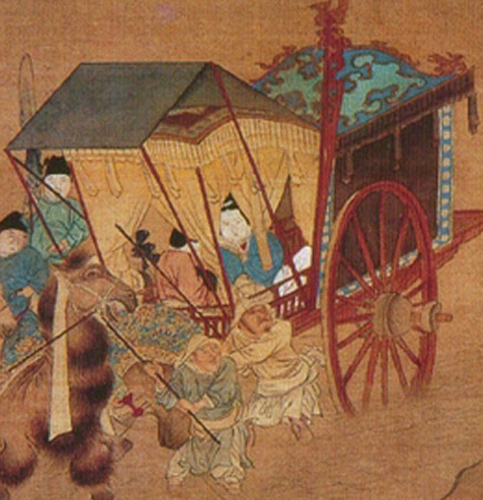 This closeup shows a pipa in the cart. I found this image on several websites, but have not been able to find out where the original is. Another interesting depiction of this scene is a long scroll called 明妃出塞圖 Lady Mingfei Leaving the Country (excerpt, in particular the pipa), attributed to "宮素然 Gong Suran" (perhaps a female Daoist of the Jin dynasty, 1115 - 1234). I found it on the website of the 日本大阪市立美術館 Osaka Municipal Museum of Art, but later could not access that so I have copied it here. Zha's Guide separately lists Longshuo Cao (7/73/113) and Zhaojun Chu Sai (16/167/365). but it combines Longxiang Cao with Longshuo Cao, though it is actually a separate melody with a separate tuning. The Appendix below has further details, including some concerning related early titles, but it should be emphasized that there is no direct evidence linking the surviving melodies with any of the corresponding melody titles from the Song dynasty and earlier. See another footnote below for pre-Ming listings. To sum up: qin melodies on this theme are very ancient, probably pre-Tang dynasty, and versions of the present melody survive under various titles in at least 17 handbooks from 1425 to 1618. A different melody using some of these titles but most commonly a different one, Long Xiang Cao, then survives in at least 11 handbooks from 1689 to 1910. The various titles are discussed in the footnotes below. Those featured in qin melodies, in addition to Wang Zhaojun, include Cai Wenji (abducted). Another, with no such connection, was Li Xijun. Entrusting my welfare to a foreign country -- the King of Wusun. Meat my food -- fermented milk my drink. Living here, constantly longing for my native soil -- a broken heart. Would that I change into a yellow heron -- homeward bound. Translation by Jennifer W. Jay from her entry in Biographical Dictionary of Chinese Women. Zhaojun is sometimes also separated into Zhao Jun. Her original name was Wang Qiang 王牆, also written 王檣 and 王嬙. 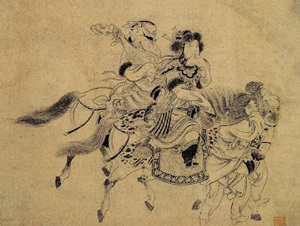 Other characters in the story include the painter 毛延壽 Mao Yanshou and her Xiongnu prince husband, 呼韓邪 Hu Hanxie. A listing of sources for more information on the story and history behind it can be found in the Wikipedia entry. 49812.393 only 龍翔 Longxiang (dragon soaring; place name). In handbooks dated 1557, 1585 and 1618, Longxiang Cao was used as the title (or alternate title) of the melody in wuyi tuning originally called Longshuo Cao and Zhaojun Yuan. Today, however, Longxiang Cao generally refers to a different melody on the Zhaojun theme, still active in the modern repertoire. This latter melody, using shangjiao mode (standard tuning) seems to have been first published in 1689 (XIV/322), where it is called Zhaojun Yuan. After this the old melody in wuyi tuning was no longer published, and in Ziyuantang Qinpu (1802) the new melody was given the title Longxiang Cao. This new melody has appeared in about 10 handbooks since 1689, after 1802 generally called Longxiang Cao, though there is often a note saying "also called Zhaojun Yuan". In discussing this melody Xu Jian (see QSCB p.163) uses the phrase "龍翔鳳舞 dragons soar and phoenixes dance" to suggest a connection between this melody and the old title 飛龍引 Fei Long Yin; none of the available texts seemt to support this. There are recordings of Longxiang Cao by Gong Yi, Guan Pinghu, Li Fengyun, Liu Chuhua, Liu Shaochun, Zhang Ziqian and others. 14124.161 Mingjun says name of 21295.852 Wang Zhaojun. Also in Seng, Most Ancient (see below). For drama, see for example Han Gong Qiu (or Han Gong Qiu Yuan; 18531.161 漢宮秋[怨]), a Yuan qu apparently on this theme. A play of this title by 馬致遠 Ma Zhiyuan (ca. 1250 - ca. 1323) is translated in Liu Jung-En, Six Yuan Plays, Penguin Classics, 1972. The title Han Gong Qiu [Yuan] also commonly refers to the story of another palace concubine, Ban Jieyu, who complains of rarely seeing the emperor (see 秋扇吟 Qiushan Yin, a poem and an alternate title of Han Gong Qiu). These are all set to music in 1511. YFSJ also has other poems on this theme; for example, Folio 29 (pp.424-435) has a 王明君 Wang Mingjun and 王昭君 Wang Zhaojun with lyrics by a number of poets. Her tears moistened [the] spring breeze, her temple locks drooping. Pacing up and down, gazing at her own shadow, so pallid. She still caused her lord-king to lose control. When have I ever seen anything like this in my life? At once causing Mao Yanshou to be wrongly killed. Sadly, she wore out her dresses from the Han palace. But year after year there were only wild geese flying by. Take care in the city of felt tents—don’t think on us. Haven’t you seen how Ajiao was confined in the nearby Changmen Palace? In life’s disappointment, there is no south or north. After this the closing in XLTQT (the second half of its Section 8, then Section 9) is rather similar to Section 8 of SQMP. This suggests that when playing the SQMP version the song could be inserted between Sections 6 and 7. However, there is not record of this ever having been done. 17. For the original Chinese preface see 龍朔操. 18. For the original Chinese subtitles see 龍朔操. Huangzhong Diao (HZD); "old name Zhaojun Yuan"
Yingzhong Diao, = HZD; "also called Mingfei Qu"
Tuning not indicated; = 1425? 商角音; "based on 青箱齋本 "
no mode indication; "based on 益州譜"